Well, purchases had been a bit slow but as things have improved with our cash flow I've felt more comfortable deploying some of the dividends that have built up in the account. Earlier this month I picked up a few shares in Digital Realty Trust (DLR) and last week I initiated 2 new positions, the first in US Bancorp and the second I'll be covering today. On September 18th I initiated a position in Dominion Energy (D). I purchased 15 shares at a price of $71.92 per share. The total cost basis, including commissions, came to $1,083.75 or $72.25 per share. Dominon is a Dividend Contender with 15 consecutive years of dividend increases. Based on my cost basis the YOC for my position is 4.62% and I can expect to receive $50.10 in dividends over the next year. Due to this purchase my FI Portfolio's forward 12-month dividends increased to $6,639.27. 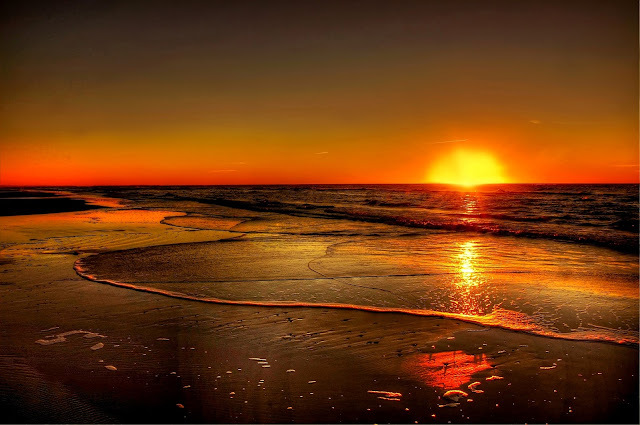 Dominion Energy is a utility that operates in Virginia and North Carolina. The business operates in 3 segments: Power Delivery, Power Generation and Gas Infrastructure. As of the end of 2017 Dominon had 26 MW of generating capacity, 6,600 miles of electric transmission lines, 57,900 miles of electric distribution lines, 14,800 miles of naturals gas pipelines and over 51,800 miles of gas distribution pipelines. Dominion has approximately 6 million utility and retail energy customers. As a dividend growth investor any potential investment must prove to me that they have the willingness and ability to "show me the money". I judge that based on a company's history of both paying and growing dividends to shareholders. As I mentioned earlier, Dominion has increased dividend payments for 15 consecutive years. I like to examine the dividend growth rates over varying time periods. Since many businesses see their operations ebb and flow this smooths out the dividend growth and can give an idea of how things could look in the future. 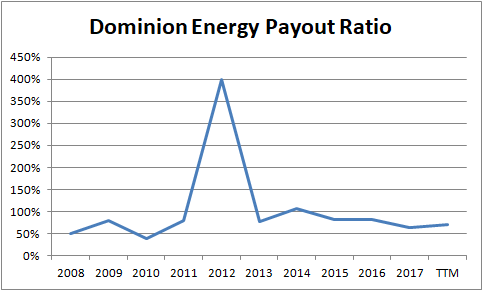 Dominion's payout ratio is a bit higher than I'd like; however, it's important to remember that they are a utility company. Most utilities pay out a high portion of their earnings to shareholders and thus carry higher payout ratios. For FY 2017 the payout ratio was 64% and for the TTM it's been right around 70%. I prefer to use free cash flow as a measure of the dividend safety; however, Dominion has been working on expansion which has led to negative free cash flow for the last 10 years. This is one concern that I have regarding Dominion and something that I'll be watching closely over time. 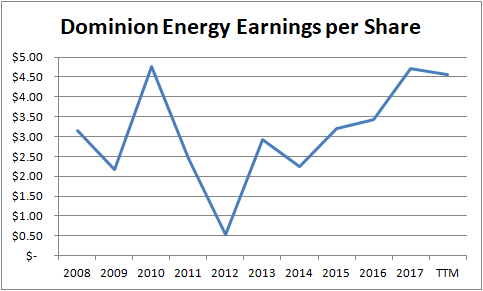 As you can see in the graph below Dominion's earnings are quite variable. It's definitely not a consistent, small step forward each year. From 2008 through 2017 earnings per share grew 49.4% or 4.6% per year. 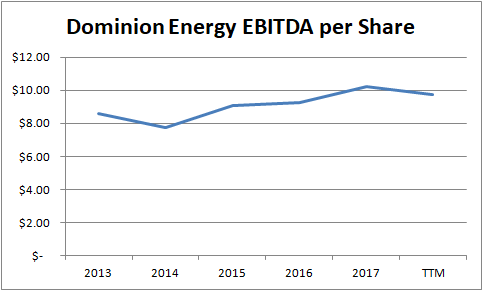 Looking at Dominion's EBITDA per share which helps account for the non-cash charges for depreciation/amortization shows that Dominion's earnings power is higher than suggested by the GAAP accounting for earnings. 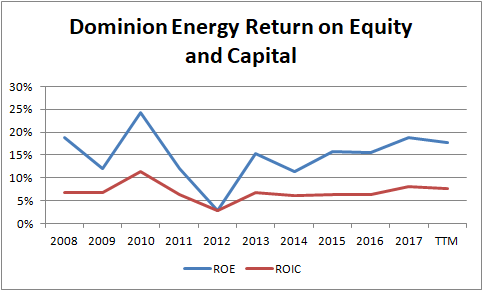 Dominion Energy has maintained solid return on equity levels over the last decade. Dominion's return on equity has routinely been around 15%. Return on invested capital is a bit lower than I'd like; however, once again we have to remember that some industries carry lower metrics across the board. It's not like Dominion is a tech company with low capital expenses and high margins. Dominion's ROIC has averaged a healthy 6.8% over the last decade. The valuation, using the average analyst's estimate for EPS, looks pretty solid. The estimate for FY 2018 is for Dominion to report $4.05 per share in earnings and $4.23 per share for FY 2019. The average 5 year growth rate is forecast to be 6.7%. That puts my purchase price of $72.25 at 17.8x 2018's estimate and 17.1x 2019's estimate. As a rough estimate of future returns we can add the growth rate estimate for earnings to the dividend yield. That gives 6.7% (earnings growth rate) + 4.62% (YOC) = 11.32% excluding any effects due to valuation changes. That looks pretty solid to me especially for a utility company. Using $3.34 as the starting dividend, my cost basis of $72.25 and a 10% required annual return, Dominion needs to average at least 5.1% annual dividend growth in order to support my purchase. That looks achievable considering annual dividend growth has routinely been in the high single digits. Obviously I wish I had purchased shares lower; however, I still think my purchase price will end up being profitable over the long term. Even better is that the initial yield at 4.62% is higher than my portfolio as a whole so it helped to boost that up slightly. What do you think of my purchase of Dominion Energy? Have you been purchasing any utility companies or shares of Dominion? Interesting deep dive, thank you for sharing it. I haven't initiated on D but do have positions in ED and PPL. I think it's pretty good value here, although time will tell of course. This was my first purchase of a utility and I hope to add some more, but that's really up to Mr. Market because the utility space hasn't exactly been ripe with value opportunities whenever I've had cash ready to purchase.